"The Vulture is one of the UNSC's most powerful units. Basically a highly armed flying assault tank packed to the brim with weapons, the Vulture is the largest aircraft fielded by the UNSC. It is designed to deliver massive damage to enemy ground troops after air superiority has been achieved. It is slow moving but carries an impressive armament of two twin-autocannons and rocket silos that can be used to deliver a devastating barrage to enemies in a wide area. Crewed by highly trained UNSC pilot and gunners, the Vulture is an expensive unit and is usually reserved for difficult or lengthy battles. Being slow, it is vulnerable to anti-aircraft fire and enemy aircraft, but it is surprisingly resilient." The AC-220 Vulture is a heavy gunship used by the United Nations Space Command during the Human-Covenant War. It is the preferred aerial combat vehicle during prolonged air-and-ground engagements, particularly against heavily fortified enemy strongholds. The Vulture is a successor of the older AC-47, AC-119, AC-130, and AC-163 gunships. It was designed in 2498 to combat the Insurrection in the Outer Colonies. Unlike most smaller UNSC craft, the Vulture is suspended in the air by a series of ducted fans visible near the rear of the aircraft, housing jet engines like the D77-TC Pelican. Due it its much larger mass and cross-section, it is slower than other UNSC aircraft, such as the AV-14 Hornet and the AV-22 Sparrowhawk, but is armed with a number of missile pods for use against air and ground units, as well as a pair of hull-mounted autocannons. The Vulture requires a large number of highly trained UNSC pilots and gunners to operate, making them expensive to deploy in terms of personnel (as opposed to the Sparrowhawk and Hornet, which require a single pilot and possibly a copilot). It lacks radiation shielding, preventing it from traveling in space. These factors, coupled with the amount of time it takes to build one, means that the Vulture is usually only reserved for difficult and lengthy battle situations and eliminating dug-in enemy forces. The AC-220 Vulture was used during both the Insurrection and Human-Covenant War. In 2531 the crew of the UNSC Spirit of Fire used several Vultures during the Battle of the Etran Harborage against the Covenant, Flood and Sentinels. Following the Human-Covenant War, few Vulture gunships remained in service with the UNSC Armed Forces due to irreplaceable combat losses by 2545. However, by 2557, the Office of Naval Intelligence's Materials Group began considering the possibility of restarting production of the Vulture with the benefit of incorporating new technologies and applying improved materials. By April 2553, the Insurrectionists on Venezia had acquired several Vultures and hid them in the old sandstone quarry next to Mount Longdon Road for use by the Venezian Militia. On March 11, 2558 several AC-220 Vultures belonging to the Spirit of Fire, alongside multiple AV-22 Sparrowhawks, attacked the UNSC Infinity when the Pilgrims' Pride was pulled into the Infinity's docking bay. A slow unit which can take massive amounts of damage before destruction, the Vulture is the largest ground-based aircraft fielded by the UNSC. It is able to fight against both air and ground units due to its weapon configuration: Argent V missile pods are used against enemy aircraft, while GAU-23 autocannons are designed for engaging ground targets. It can use its A-74 missile launcher to deliver massive damage to slow and/or static units. The Vulture's main drawbacks are its cost and the large amount of time it takes to build one; it is also vulnerable to fast counter-attacks and takes a great deal of time to repair. The Vulture should be reserved for buildings and ground units for the greatest effect. Although Vultures possess adequate anti-aircraft ordnance, they should be escorted by M9 Wolverines to lessen the threat of aerial attacks. In-game, the Vulture is considered an "über unit", and is constructed at the airpad, and requires six population, 900 resources, and a tech level of four. It can be upgraded with the Mega Barrage upgrade, potentially doubling its barrages' power; this upgrade is purchased at the air pad and costs 800 resource points and requires a minimum tech level of 4. 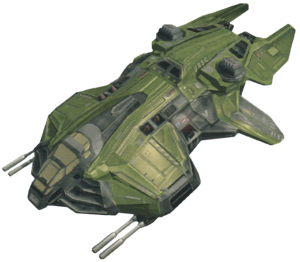 For balance, the Vulture is one of only two vehicle units in Halo Wars that cannot be commandeered by Spartans, the other being the Covenant Scarab. The Vulture is the only air unit that is not immobilized by a single Vampire's stasis drain, though it is still damaged and can be immobilized by multiple synchronous drains. The Vulture can be built at the Airpad by all UNSC leaders. Unlike its Halo Wars counterpart, the Vultures in Halo Wars 2 can be hijacked by Spartans, as the G81 Condor is now the UNSC's only Super Unit. It is effective against vehicles, aircraft, and structures, while only being okay against infantry. In Blitz, Vultures costs 140 energy. In the campaign, the Vulture starts to appear in the mission The Foundry, and is given in Last Stand as part of the fifth batch of reinforcements. The Vulture is the only UNSC unit in Halo Wars that does not come out of the firebase upon deployment. Instead, it seems to descend from the UNSC Spirit of Fire, decelerating just before touching the ground. The generic in-game Vulture pilot in Halo Wars is voiced by Braden Lynch, who later voiced Anthony Madsen in Halo 4's Spartan Ops. Concept art of the Vulture for Halo Wars. Early concept art of the Vulture before finalization. Conceptualized orthographic views of the Vulture. A close-up of the Vulture, showing its impressive arsenal. Concept art of the final Vulture model. Vulture firing a missile barrage at a Type-47B Scarab. A trio of AC-220 Vultures and a captured Scarab assaulting a Covenant citadel. A couple of AC-220 Vultures, AV-22 Sparrowhawks, and a D77-TC Pelican Dropship launch an all-out attack against a Covenant citadel. A Vulture with mega barrage. Vultures using their mega barrage ability. A Vulture on the cover of Halo: Escalation Issue 4. A Vulture attacking the UNSC Infinity in 2558. A toy Vulture from MEGA Brands. Concept art of the Vulture's Phoenix missile for Halo Wars 2. A Vulture in the Halo Wars 2 Open Beta. An AC-220 and G81 Condor defend Ellen Anders during the Battle of Installation 00 in Halo Wars 2. An army of AC-220 Vultures in Halo Wars 2. Dark Horse replica of a Vulture. External Render of the Vulture from Halo Wars 2.